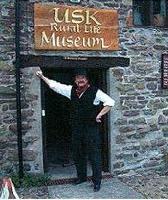 The Museum portrays life in the Welsh Borders as it was at any time between 1850 and the end of World War II. The contents are housed in a picturesque ancient malt barn and adjoining buildings. They have been collected by a group of local enthusiasts determined that the equipment and machinery on which people depended in the their day to day lives should be preserved for posterity. The visitor can see a typical farmhouse kitchen, dairy and laundry, look in on the blacksmith, the wheelwright, the cobbler, see all the equipment of the farmer - from wagons to tractors to billhooks and hoes. You can also learn about coopering and cider making! Plus, there are some interesting relics of World War II. For gadget enthusiasts there are hundreds of items ranging from a Victorian knife cleaner to a wooden washing machine. There is plenty for bike enthusiasts too, including a fine penny farthing specimen and many accessories. A fully working model railway allows you to picture the scene on the arrival of steam trains in the local area. Recent additions include an extensive collection of superbly crafted scale models of horse-drawn vehicles and a wonderful collection of corn dollies and sculptures made of straw. The museum employs an education officer and is able to provide a wide range of activities for children either at the museum or through its outreach programme. The nearest railway station is Newport (20km away). Onward travel is by bus from Newport bus station (500m) or by Taxi. The bus stop for the museum is located 200 metres away and is served by service number 60 which operates between Newport, Usk and Monmouth.